Here are some snazzy birthday facts about 9th of July 1925 that no one tells you about. Don’t wait a minute longer and jump in using the content links below. Average read time of 9 minutes. Enjoy! What day was my birthday Jul 9, 1925? July 9, 1925 was a Thursday and it was the 190th day of the year 1925. It was the 28th Thursday of that year. The next time you can reuse your old 1925 calendar will be in 2026. Both calendars will be exactly the same! This is assuming you are not interested in the dates for Easter and other irregular holidays that are based on a lunisolar calendar. There are 80 days left before your next birthday. You will be 94 years old when that day comes. There have been 34,253 days from the day you were born up to today. If you’ve been sleeping 8 hours daily since birth, then you have slept a total of 11,418 days or 31.26 years. You spent 33% of your life sleeping. Since night and day always follow each other, there were precisely 1,160 full moons after you were born up to this day. How many of them did you see? The next full moon that you can see will be on May 18 at 21:13:00 GMT – Saturday. Fun stat: Your first one billion seconds (1,000,000,000) happened sometime on March 17, 1957. If a dog named Folus - a West Highland White Terrier breed, was born on the same date as you then it will be 392 dog years old today. A dog’s first human year is equal to 15 dog years. Dogs age differently depending on breed and size. When you reach the age of 6 Folus will be 40 dog years old. From that point forward a small-sized dog like Folus will age 4 dog years for every human year. The Roman military commander Avitus is proclaimed Emperor of the Western Roman Empire. War of the Spanish Succession: Austrians defeat France in the Battle of Carpi. Persian prophet Báb is executed in Tabriz, Persia. William Jennings Bryan delivers his Cross of Gold speech advocating bimetallism at the 1896 Democratic National Convention in Chicago. Future Soviet leader Joseph Stalin is exiled to Siberia for three years. Andy Warhol’s Campbell’s Soup Cans exhibition opens at the Ferus Gallery in Los Angeles. A car bomb destroys a Renault motor car owned by the famed “Nazi hunters” Serge and Beate Klarsfeld at their home in France. A note purportedly from ODESSA claims responsibility. The Parliament of Canada passes the Nunavut Act leading to the 1999 creation of Nunavut, dividing the Northwest Territories into arctic (Inuit) and sub-arctic (Dene) lands based on a plebiscite. What does my birthday July 9, 1925 mean? 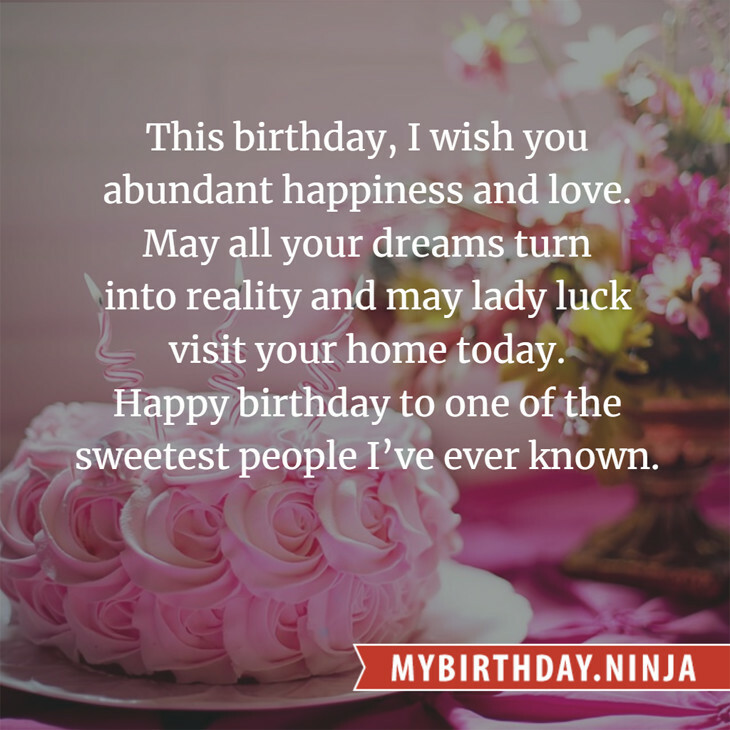 Your birthday numbers 7, 9, and 1925 reveal that your Life Path number is 6. It represents justice, nurturing and responsibility. You possess great compassion and seek to be of service to others. The following celebrities also have the same life path number: Atom Egoyan, Peter Holsapple, Jamielee McPherson, Billy Vera, Jiřina Jirásková, Stan Hansen, Jhong Hilario, John Macurdy, Megumi Ishii, Jesse Belvin. 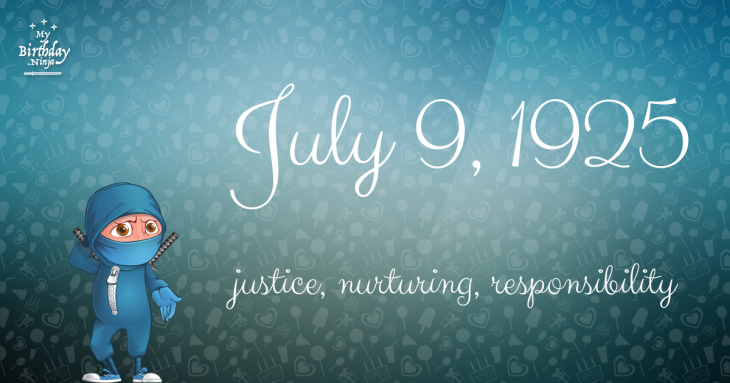 What is the birthday horoscope for Jul 9, 1925? The Western zodiac or sun sign of a person born on July 9 is Cancer ♋ (The Crab) – a cardinal sign with Water as Western element. The ruling planet is Moon – the celestial body of moods and emotions. According to the ancient art of Chinese astrology (or Eastern zodiac), Ox is the mythical animal and Wood is the Eastern element of a person born on July 9, 1925. Fun fact: The birth flower for 9th July 1925 is Larkspur for haughtiness. What is the Love Match for Jul 9, 1925? When it comes to love and relationship, you are most compatible with a person born on November 29, 1929. You have a Love Match compatibility score of +191. Imagine being in love with your soul mate. On the negative side, you are most incompatible with a person born on January 27, 1941. Your incompatibility score is -226. You’ll be like a cat and a dog on a love-hate relationship. Arf-arf, I want to bite you. Meow-meow, stay away from me! I do not know how you feel about this, but you were a male ♂ in your last earthly incarnation. You were born somewhere around the territory of Ireland approximately on 850. Your profession was seaman, cook, carpenter. What is the popular baby name on 9 Jul 1925? Here’s a quick list of all the fun birthday facts about July 9, 1925. Celebrities, famous birthdays, historical events, and past life were excluded. Try another birth date of someone you know or try the birthday of these celebrities: March 31, 1944 – Mick Ralphs, English singer-songwriter and guitarist (Mott the Hoople and Bad Company); April 20, 1991 – Thomas Curtis, American actor; December 20, 1931 – Terry Sanders, American director, producer, and screenwriter.